The very existence of stress generates more stress. The more of it that piles up, the less we're able to cope. It's time to take back control. 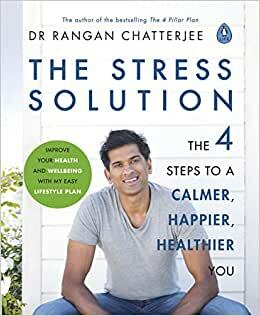 For Dr Chatterjee, the key to solving the problem of stress is about addressing the underlying causes of our anxieties in four main areas- Body, Mind, Relationships, and Life. Pairing the science of what happens in our brains and our bodies when we become stressed, with personal accounts and patient cases, Dr Chatterjee provides easy to implement solutions for the whole spectrum of stressors we face on a daily basis. From identifying our 'Micro Stress Doses' - those individual portions of stress we encounter moment to moment, and our 'Macro Stress Doses' - those big adverse life events that can have long-lasting impact; Dr Chatterjee will take you on a journey to regain control over your stress, rather than it having control over you. Start reading The Stress Solution on your Kindle in under a minute. This is Dr. Chatterjee‘s second book. I found both of them absolutely excellent, full of practical advice and rooted in scientific study and clinical information. Chatterjee‘s writing style is warm and personal and gives you a feeling that you’re having a conversation with him about your life. I highly recommend this book as a tool to help navigate through modern life! 5.0 out of 5 starsTHANK YOU DR. CHATTERJEE !!! What an AMAZING book !!! Thank you Dr. Chatterjee .. I think everyone should buy this book we live in very stressful times and this book is a must very helpful ..
5.0 out of 5 starsInvestment for life! I like this book because it is easy to understand and if you apply its principles it will change your life! Thank you Dr Rangan Chatterjee! !